This tutorial depends on step-4. Computations on successively refined grids. At least in the mathematical sciences, it is common to compute solutions on a hierarchy of grids, in order to get a feeling for the accuracy of the solution; if you only have one solution on a single grid, you usually can't guess the accuracy of the solution. Furthermore, deal.II is designed to support adaptive algorithms where iterative solution on successively refined grids is at the heart of algorithms. Although adaptive grids are not used in this example, the foundations for them is laid here. 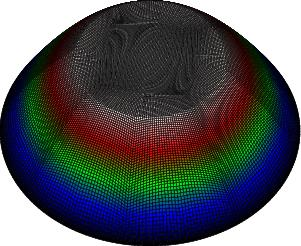 Finite element programs usually use extensive amounts of computing time, so some optimizations are sometimes necessary. We will show some of them. Regarding the mathematical side, we show how to support a variable coefficient in the elliptic operator and how to use preconditioned iterative solvers for the linear systems of equations. If \(u\) is the vertical deflection of a thin membrane, then \(a\) would be a measure of the local stiffness. This is the interpretation that will allow us to interpret the images shown in the results section below. Since the Laplace/Poisson equation appears in so many contexts, there are many more interpretations than just the two listed above. The implementation in the assemble_system function follows immediately from this. The main class is mostly as in the previous example. The most visible change is that the function make_grid_and_dofs has been removed, since creating the grid is now done in the run function and the rest of its functionality is now in setup_system. Apart from this, everything is as before. In step-4, we showed how to use non-constant boundary values and right hand side. In this example, we want to use a variable coefficient in the elliptic operator instead. Since we have a function which just depends on the point in space we can do things a bit more simply and use a plain function instead of inheriting from Function. This is the implementation of the coefficient function for a single point. We let it return 20 if the distance to the origin is less than 0.5, and 1 otherwise. This function is as before. As in the previous examples, this function is not changed much with regard to its functionality, but there are still some optimizations which we will show. For this, it is important to note that if efficient solvers are used (such as the preconditioned CG method), assembling the matrix and right hand side can take a comparable time, and you should think about using one or two optimizations at some places. Next is the typical loop over all cells to compute local contributions and then to transfer them into the global matrix and vector. The only change in this part, compared to step-4, is that we will use the coefficient function defined above to compute the coefficient value at each quadrature point. Note that for the present case, SSOR doesn't really perform much better than most other preconditioners (though better than no preconditioning at all). A brief comparison of different preconditioners is presented in the Results section of the next tutorial program, step-6. Writing output to a file is mostly the same as for the previous example, but here we will show how to modify some output options and how to construct a different filename for each refinement cycle. For this example, we would like to write the output directly to a file in Encapsulated Postscript (EPS) format. The library supports this, but things may be a bit more difficult sometimes, since EPS is a printing format, unlike most other supported formats which serve as input for graphical tools. Therefore, you can't scale or rotate the image after it has been written to disk, and you have to decide about the viewpoint or the scaling in advance. That shall suffice. There are more flags, for example whether to draw the mesh lines, which data vectors to use for colorization of the interior of the cells, and so on. You may want to take a look at the documentation of the EpsFlags structure to get an overview of what is possible. The above way to modify flags requires recompilation each time we would like to use different flags. This is inconvenient, and we will see more advanced ways in step-19 where the output flags are determined at run time using an input file (step-19 doesn't show many other things; you should feel free to read over it even if you haven't done step-6 to step-18 yet). In previous examples, we have already used some of the functions from the GridGenerator class. Here we would like to read a grid from a file where the cells are stored and which may originate from someone else, or may be the product of a mesh generator tool. We would now like to read the file. 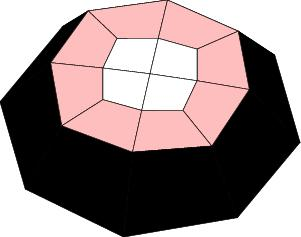 However, the input file is only for a two-dimensional triangulation, while this function is a template for arbitrary dimension. Since this is only a demonstration program, we will not use different input files for the different dimensions, but rather quickly kill the whole program if we are not in 2D. Of course, since the main function below assumes that we are working in two dimensions we could skip this check, in this version of the program, without any ill effects. It turns out that more than 90 per cent of programming errors are invalid function parameters such as invalid array sizes, etc, so we use assertions heavily throughout deal.II to catch such mistakes. For this, the Assert macro is a good choice, since it makes sure that the condition which is given as first argument is valid, and if not throws an exception (its second argument) which will usually terminate the program giving information where the error occurred and what the reason was. (A longer discussion of what exactly the Assert macro does can be found in the exception documentation module.) This generally reduces the time to find programming errors dramatically and we have found assertions an invaluable means to program fast. On the other hand, all these checks (there are over 10,000 of them in the library at present) should not slow down the program too much if you want to do large computations. To this end, the Assert macro is only used in debug mode and expands to nothing if in optimized mode. Therefore, while you test your program on small problems and debug it, the assertions will tell you where the problems are. Once your program is stable, you can switch off debugging and the program will run your real computations without the assertions and at maximum speed. More precisely: turning off all the checks in the library (which prevent you from calling functions with wrong arguments, walking off of arrays, etc.) by compiling your program in optimized mode usually makes things run about four times faster. Even though optimized programs are more performant, we still recommend developing in debug mode since it allows the library to find lots of common programming errors automatically. For those who want to try: The way to switch from debug mode to optimized mode is to recompile your program with the command make release. The output of the make program should now indicate to you that the program is now compiled in optimized mode, and it will later also be linked to libraries that have been compiled for optimized mode. In order to switch back to debug mode, simply recompile with the command make debug. ExcInternalError is a globally defined exception, which may be thrown whenever something is terribly wrong. Usually, one would like to use more specific exceptions, and particular in this case one would of course try to do something else if dim is not equal to two, e.g. create a grid using library functions. Aborting a program is usually not a good idea and assertions should really only be used for exceptional cases which should not occur, but might due to stupidity of the programmer, user, or someone else. The situation above is not a very clever use of Assert, but again: this is a tutorial and it might be worth to show what not to do, after all. 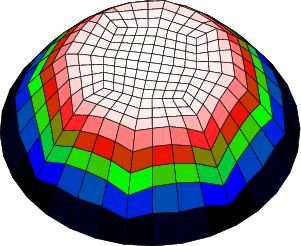 The grid in the file describes a circle. Therefore we have to use a manifold object which tells the triangulation where to put new points on the boundary when the grid is refined. 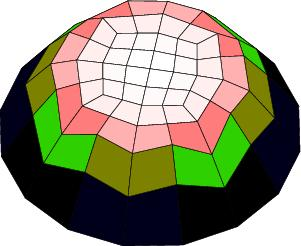 Unlike step-1, since GridIn does not know that the domain has a circular boundary (unlike GridGenerator::hyper_shell) we have to explicitly attach a manifold to the boundary after creating the triangulation to get the correct result when we refine the mesh. Now that we have a mesh for sure, we write some output and do all the things that we have already seen in the previous examples. std::cout << " Number of active cells: "
<< " Total number of cells: "
13 CG iterations needed to obtain convergence. 18 CG iterations needed to obtain convergence. 29 CG iterations needed to obtain convergence. 52 CG iterations needed to obtain convergence. 95 CG iterations needed to obtain convergence. 182 CG iterations needed to obtain convergence. Due to the variable coefficient (the curvature there is reduced by the same factor by which the coefficient is increased), the top region of the solution is flattened. The gradient of the solution is discontinuous there, although this is not very clearly visible in the pictures above. We will look at this in more detail in the next example.